It’s cold outside on Dec. 4, but it’s hot in the library upstairs at Amidon-Bowen Elementary School (ABES). 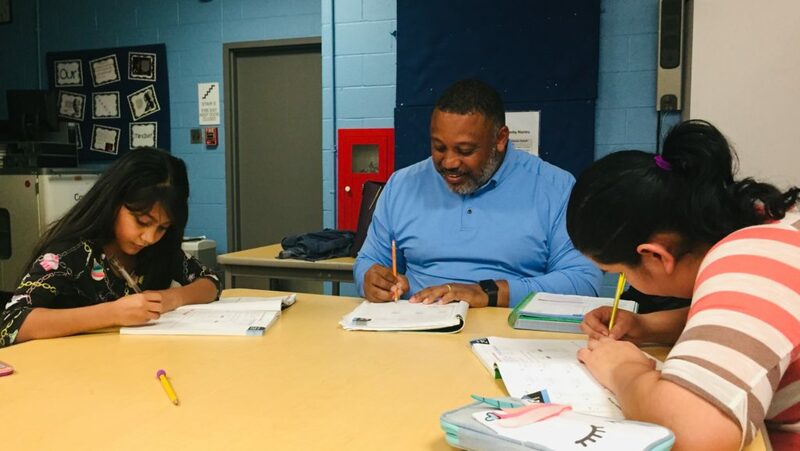 Math tutor Bryan Harris exclaims, “We’re cooking with gas!” as 3rd grade student Tatianna, and her mother, Dayana Torres, both get the correct answer to the rounding problem they are working on. Across the table, Harris reaches out both hands for a three-way high five. Harris is one of nine new tutors working with ABES 3rd grade students through a new initiative led by the SWNA Education and Scholarship Taskforce. Student performance in math has been improving at Amidon-Bowen. The percentage of students scoring on grade level on the national PARCC test doubled from 2017 to 2018. But, 45% of first through fifth grade students still entered this school year more than two years behind in Math. (This is down from 61% in 2016). The tutoring program was started by Robert St. Cyr, executive director of Community Scholar, at Capitol Hill Montessori at Logan and expanded this year to Amidon-Bowen. After discussing the project with SWNA leaders Bruce Levine, Vyllorya Evans and Thelma Jones, St. Cyr worked with Murali Balji to recruit volunteers in the Southwest community. From there, the team coordinated with school administration and teachers to get the program going. Kayla Winters, ABES math interventionist, invited parents for an informational breakfast and was responsible for recruiting all the students in the math program. Zip Zap IT Solutions, SWBID and Westminster Church provided initial funding for books and materials. Eighteen students and nine tutors are currently participating in Math tutoring. Students meet with their tutors once or twice a week to learn critical 3rd grade math skills like rounding, telling time, and fractions. Winters says that students in the program are seeing dramatic improvements in the classroom. Some have moved into the advanced math group and are even helping to teach their peers. Thanks to all of the Southwest tutors for their valuable contributions to our neighborhood school: Rick Bardach, Grace Byrd, Stacy Cloyd, Sadia Fatemi, Diana Finegold, Diane Ford, Peri Hamlin, Bryan Harris, Audrey Hinton, Valerie Lubrano, Alan Philpott, Diane Reeves, Garon Reeves, Joelle Rudney and Jacqui Stark. The program is still accepting students! If you have a third grader who attends Amidon-Bowen Elementary School, please talk to Ms. Winters or Ms. Cureton, or email Kayla.Winters@dc.gov. To learn more about the program or sign up to participate as a volunteer, contact Robert St. Cyr at friends@communityscholar.org. 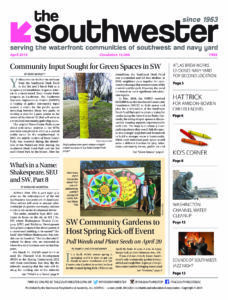 To make a tax-deductible donation to support the program, visit https://www.mightycause.com, search for Southwest Neighborhood Assembly Inc. and select the SWNA Education Task Force as the recipient. You can also write a check to the Southwest Neighborhood Assembly, note “Education Fund” in the memo line and mail it to: SWNA Attn: Education Fund, PO Box 70131, Washington, DC 20024.